A monument commemorates the bicentenary of the first English ship in Tasmanian waters on 10th March 1773. Captain Tobias Furneaux anchored his ship off Bruny Island's coast in 1773, and Rear Admiral Bruny D`Entrecasteaux after whom Bruny Island is named. In November 1771, Captain Tobias Furneaux was given command of Adventure, which accompanied James Cook (in Resolution) on his second voyage. On this expedition Furneaux was twice separated from his leader (8 February 1773 to 19 May 1773; and 22 October 1773 to 14 July 1774, the date of his return to England). On the former occasion (1773) he explored a great part of the south and east coasts of Van Diemen's Land (now Tasmania) , and made the earliest British chart of the same. 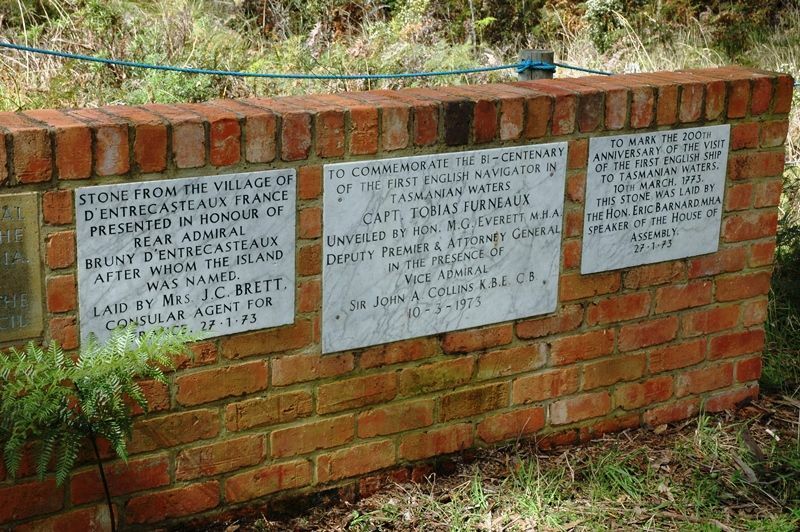 Bruni d'Entrecasteaux (8 November 1737 – 21 July 1793) was a French naval officer, explorer and colonial governor. He is perhaps best known for his exploration of the Australian coast in 1792, while searching for the La Pérouse expedition. Bruni d'Entrecasteaux was fortunate in having good officers and scientists; the most important from the exploration point of view was the expedition's first hydrographical engineer, C.F Beautemps-Beaupré, who is now regarded as the father of modern French hydrography. Beautemps-Beaupré, while surveying the coasts with Lieutenant Crétin, discovered that Adventure Bay, which had been discovered by Tobias Furneaux in 1773, was on an island which was separated from the mainland by a fine navigable channel. On 16 May 1792, d'Entrecasteaux commenced to sail the ships through the channel, and this was accomplished by the 28th. Port Esperance, the Huon River, and other features were discovered, named, and charted, the admiral's names being given to the channel (D'Entrecasteaux Channel) and the large island (Bruny Island) separated by it from the mainland. This Bicentenary Memorial was made possible by the Government of Tasmania, Mrs. J. 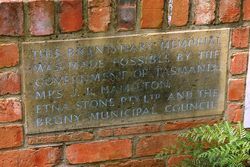 B. Hamilton, Etna Stone Pty Ltd and the Bruny Municipal Council. Presented in honour of Rear Admirla Bruny D`Entrecasteaux after who the island was named.